Death of a Project: Who's the Boss? Here I’m sitting in the Board Room, smiling on learning how a project is being murdered cold blooded! Every process has a structure, so is true with this “closing the ongoing Project” thing too. We worked like daily wage labourers over 2 months, literally 24*7, and what a grand-result we are witnessing, the board sentencing us, two poor people, to hit the last nail in the coffin! So, it started 6-7 weeks ago, when we were assigned to look after this new project, to analyse and appraise the case. We did the best, and the Board killed the engine running some excel-sheet model! But, this post is not to talk about our hard work, it’s on what I’m scribbling and doodling here in the board room. 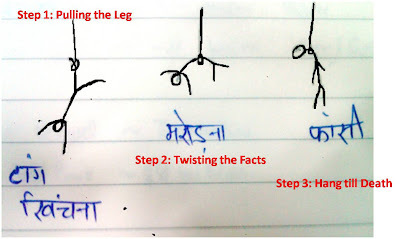 So, ‘Step-1’ is about pulling the leg (टांग खींचना). Every domain-expert starts with his/her own set of criticism, and finally ends with an “I can’t say” notion. So much of “I can’t say” is ultimately to result in “F**k the project up”; but before it comes the ‘Step-2’, just because it’s the systematic way to dump! Step-2 starts with mock decision phase twisting (मरोड़ना ) “any-how” each and every logical and illogical, whatever, points have been put forward in due course. Of no significance, validating the axioms. And, then is the turn of the most brutal step, the Step-3, when while paying due honour and gratitude, the Project, which was sometime back undertaken joyfully is , is being dumped। No mercy, no consideration is paid to the hard work of some fools like us. In fact, as said earlier too, to hit last nail is the final task that also expected to be executed by those jerks compiling minutes of the meeting, report on why the board dumped the project. One thing that I’ve learned from such different instances is that one realizes what “could it have been”, only once the one misses the target thought to be not much attractive! To compare the ongoing project with the ‘would be’ projects, a little proactive effort may help in delaying the death, but what decides the fate is economics. So whosoever is the decision-maker, the labour class; Boss is Economics!